If you were an 1980s kid then ‘The Pump’ means only one thing: The Pump shoe from Reebok. The manual air pump system allowed air to inflate cushions to form the shoe better to the person wearing it. Targeted at the basketball industry, the shoe was a huge hit in the early 90s and air cushioning found its way into more than just shoes. Now 20 years later the simple idea of an air inflated custom fit can be found in the offroad world with the LS2 MX456e Helmets. They began as a helmet manufacturer in 1991 in China. In 2006 they decided to brand their own helmets and LS2 was created. After years of growth, both geographically and in quality, they became available in the US in 2010 through Allwin Powersports Corporation. Today you can buy dozens of different types of helmets for on-road, off-road and snow powersports. 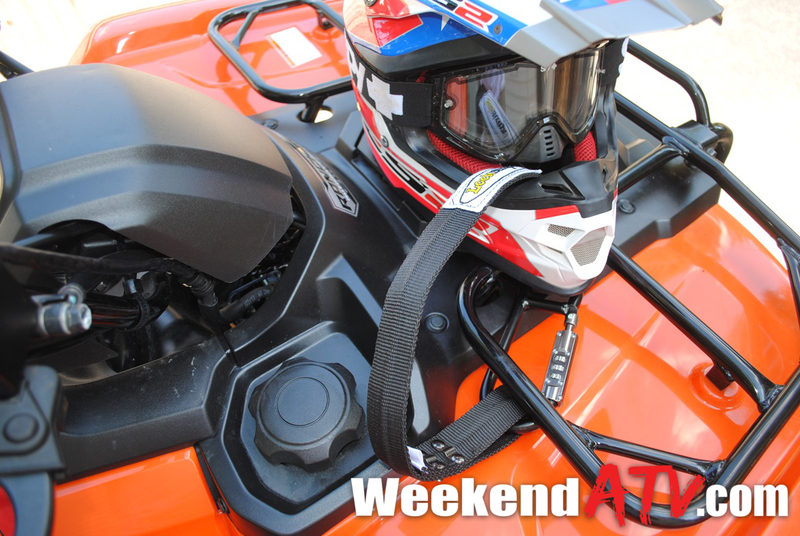 The flagship of the offroad helmets is the LS2 MX456e. LS2 sent us a beautifully patriotic USA version of MX456e to try out. Out of the box the fit was already pretty snug but after a few rides we were able to try out the inflation system. As promised, the cheek pads inflate with each press of the button, bringing back those pre-game basketball memories. If you have trouble finding the right fit in a helmet or want a custom fit this is truly the way to go. The LS2 MX456e uses a tricomposite fiberglass shell. There are vents at the mouth, the jawline, the back and two closable vents above the face opening. There are also vents at the top of face opening. The visor is mounted at three points with screws that can be tightened with a screwdriver or a coin to get them more than just hand tight. I know I’ve has visor screws fall out on trails before. The visor also has a removable extension. The odor and bacteria resistant liner is fully removable for cleaning. Ready to ride it weighs in at just under 3.2 pounds. Not sure if a Chinese helmet is tough enough for you? 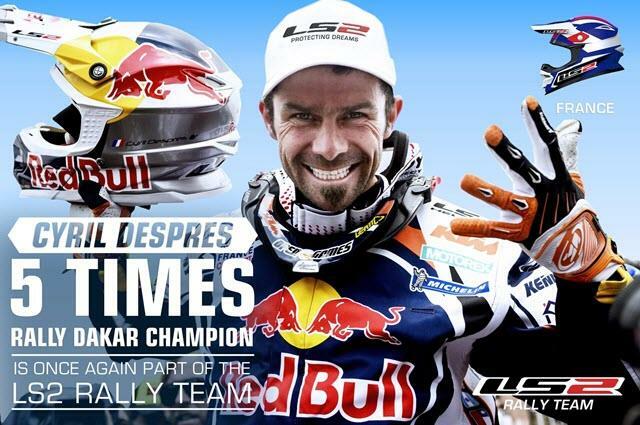 How about the fact that is is the helmet of 5 time Dakar Rally motorcycle winner Cyril Despres. The LS2 MX456e is available in sizes XS to 2XL and in 10 different colors. It is DOT certified and ECE approved. MSRP on the LS2 MX456e is $189.95. 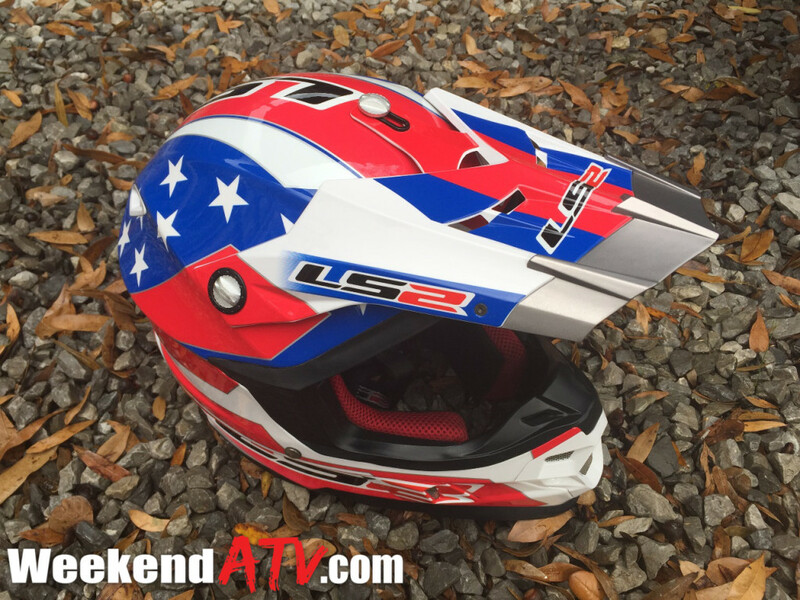 For more details on the LS2 MX456e check out http://ls2helmets.us. We live in a very technological age. And even when we are ready to hit the trails and get away from it all we still depend on having our phones, cameras, GPS and other devices. 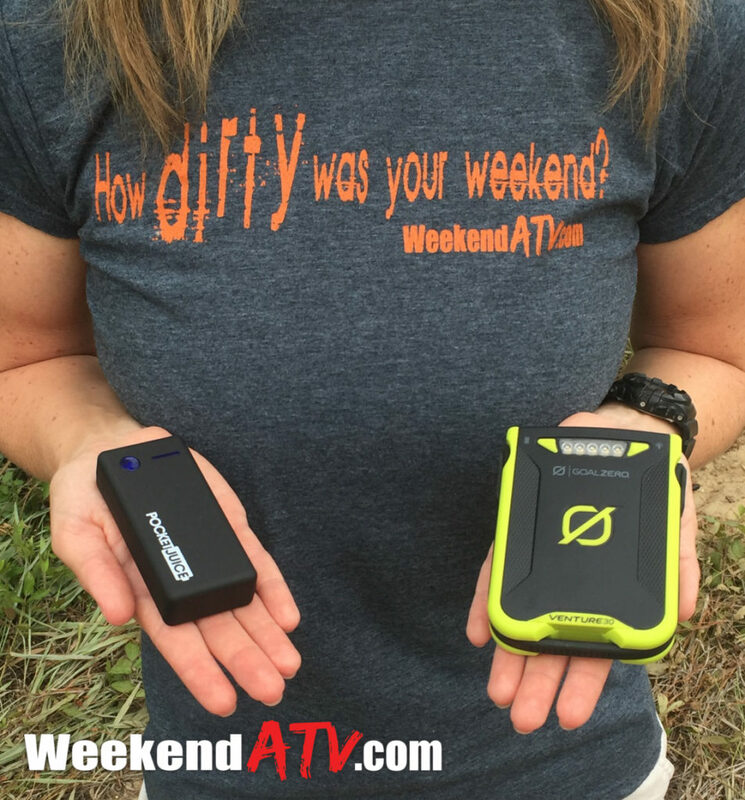 Portable batteries have become common place, but most weren’t made to handle the trails or Mother Nature. 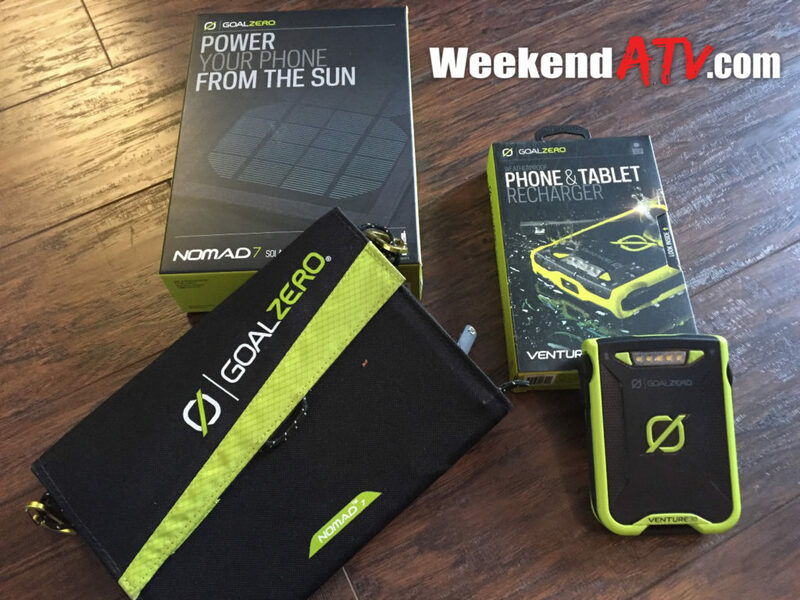 For the last year we’ve been testing the Goal Zero Venture 30 and Nomad 7 products and they have you taken care of. 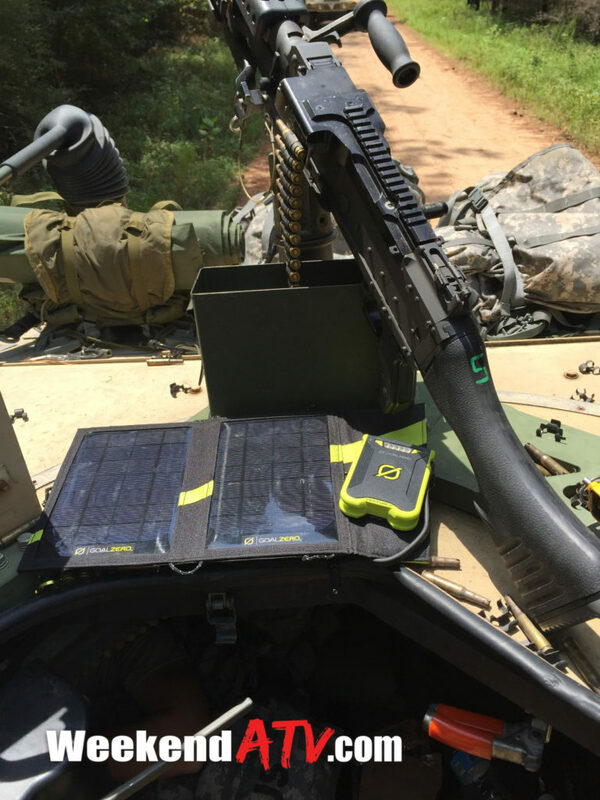 I utilize the same devices on the trails and camping as I do when I’m in the field training with the US Army, so before a field exercise I picked up the Goal Zero Venture 30 Recharger and the Nomad 7 Solar Panel. Both products are designed for the adventurer and whatever elements they might find themselves in. 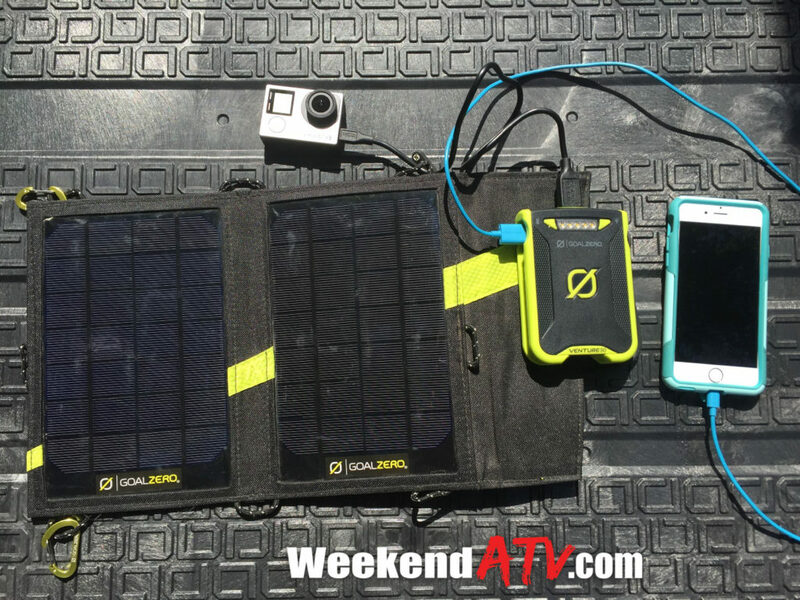 The Goal Zero Venture 30 is a portable battery pack with an IPX6 weather rating. This International Protection Marking code means that the Venture 30 has been certified with testing against 10 minutes of dripping water, 5 minutes of spraying water, 5 minutes of splashing water and 3 minutes of powerful water jets at 100 liters per minute! And it’s operating temperature range is from 32-114 degrees Fahrenheit (0-45C). Weighing in at only 8.8 ounces it won’t add much to your pack. The Li-ion battery is 29Wh and 7800mAh. When looking at batteries, the bigger these 2 numbers are, the better. Wh refers to watt-hours meaning, in this case, the Venture 30 could power a 29 watt light bulb for 1 hour, or a 5 watt phone for 6 hours, etc. The Goal Zero Venture 30 compared to a 4000mAh PocketJuice. The Goal Zero Venture 30 has 2 USB ports and a built in mini-USB cable so many phones and cameras won’t even need to bring along extra cords. Apple devices on the other hand…I digress. Charging the Venture 30 from dead off USB power takes about 5 hours. We tested it through wall power, off a computer and off a 12 volt car plug all with the same result. Output is impressive too. We ran an Apple iPhone 6 through our normal work day only using the Venture 30 to charge it. We got two and half days off the Venture 30. Off a fully charged Venture 30 you should be able to charge a smartphone 2.5 times, a GoPro camera 5 times and a tablet once. To save on time you can plug devices in while the Venture 30 is being charged back up as well. 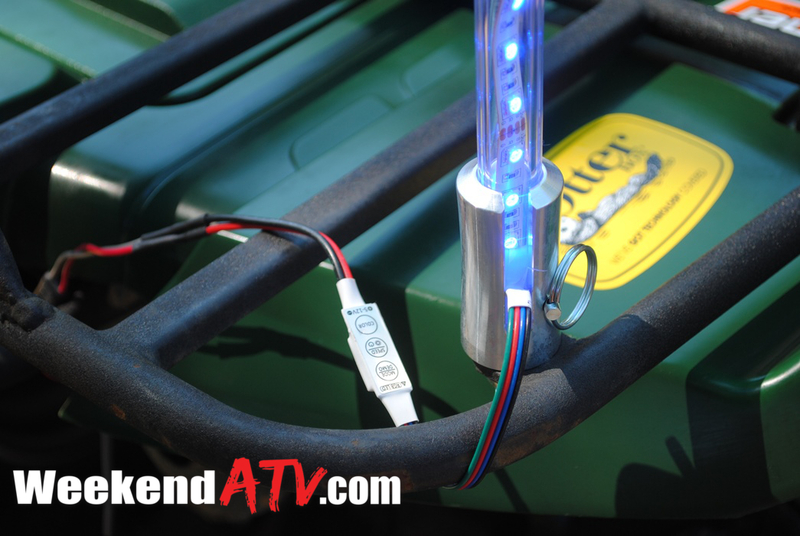 The Goal Zero Venture 30 has 5 LED lights across the front with a button on either side. Pressing one of the buttons will light up the LEDs in blue to indicate how much of a charge the Venture 30 has on a scale of 1-5. The opposite button will cause the LEDS to glow white as a backup flashlight. You can cycle through 3 brightness modes and 2 strobe modes. To give us the most versatility we also picked up the Goal Zero Nomad 7 solar panel. 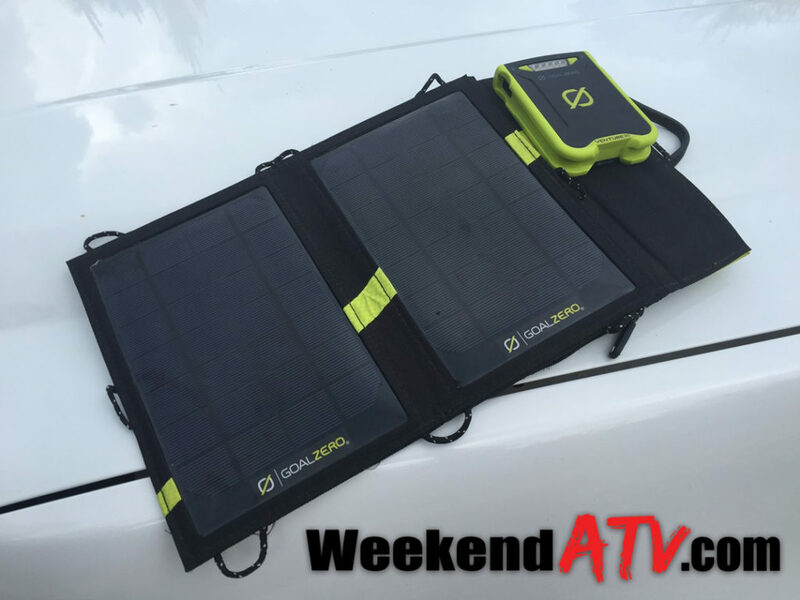 The Nomad 7 is a lightweight, weather-resistant, 7-watt solar panel that can be used to charge the Goal Zero Venture 30 or directly charge your smartphone, GPS or GoPro (no tablets). It has clipping points all around it to it can be easily strapped to a backpack or rack for charging on the go. The Nomad 7 will charge a Venture 30 from scratch in 8-16 hours depending on the amount of sun you are getting. You can chain multiple solar panels together to charge quicker. The Nomad 7 has a pocket built into itself to hold cables and the Venture 30 while it’s charging. Perhaps the most important element of our reviews is the visual element. The photos and videos that we strive to provide give additional detail and demonstration to our reviews and help each of you to better see what we see. So it’s no small investment that we put into getting those photos. One tool we have come to love is the Capture Camera Clips from Peak Design. Our line-up includes the Peak Design Capture, Capture Pro and the POV kit. GoPro has revolutionized photography and videography in our industry but doesn’t work as well for point-and-click shots, especially where zooming is desired. SLR cameras are great, but the trails can be hard on expensive photo and video equipment. 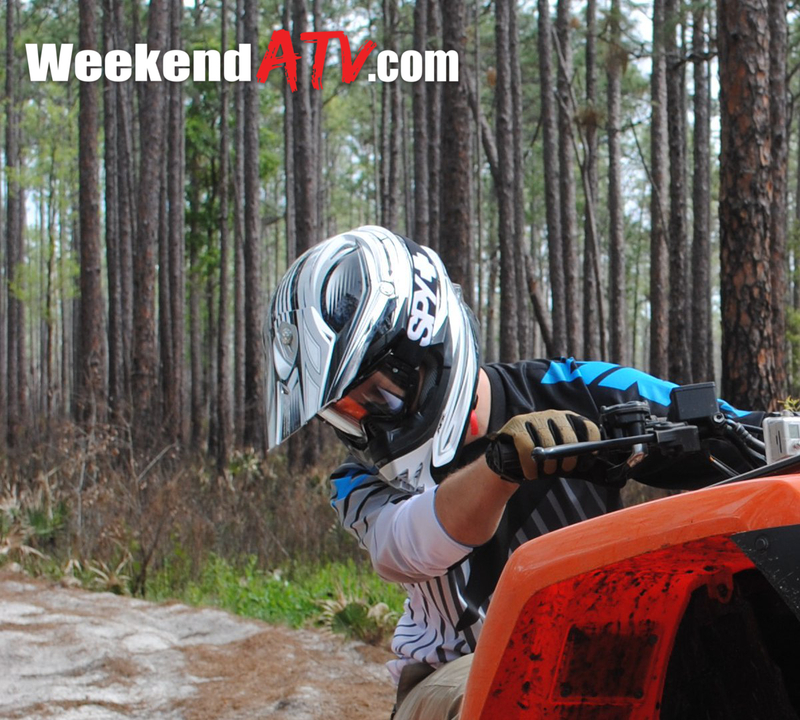 The slings that come with most cameras can’t keep the camera safe from the bouncing that occurs on the trails. Cases and bags can keep cameras secure but are inconvenient to get to. Peak Design addressed this when they created the Capture line. The Peak Design Capture Camera Clip allows a camera to be securely connected to a belt or strap with a holster design so that it can be quickly removed for the shot but is kept safe from abuse. In my personal use I have found that wearing it on the belt works great for hiking or tourist type photography. If I have a backpack or hydration pack then the shoulder straps work best. 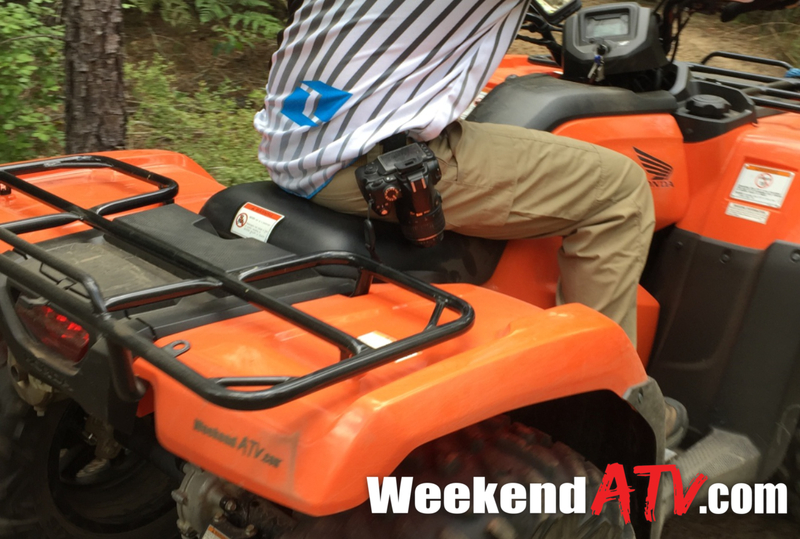 The latter is also my preferred for ATV riding as it keeps the camera up high. Incredibly easy to use, the Peak Design Capture mounts to a belt or strap very securely with thumb screws for a fit that will adjust to any normal size. The adapter screws into the tripod mount of your DSLR or any other camera with a tripod hole. The adapter securely clips into the baseplate. Now its locked in and able to withstand 200 pounds of force! To remove you simply push the red release button and slide the camera out of the holster. For additional security the release button has a twist lock to prevent inadvertent release or theft. Available in two models, the Capture and Capture Pro have a few differences. The standard Capture is made of aluminum and glass-reinforced nylon while the Capture Pro is all aluminum. The Capture Pro is also compatible with both Manfrotto RC2 tripods and Arca-type tripods where the standard capture only works with Arca. The Capture Pro also has its own tripod mounting hole allowing it to be used as a quick disconnect from a tripod or monopod. Peak Design also offers a P.O.V. Action Mount for GoPro and other action cameras. 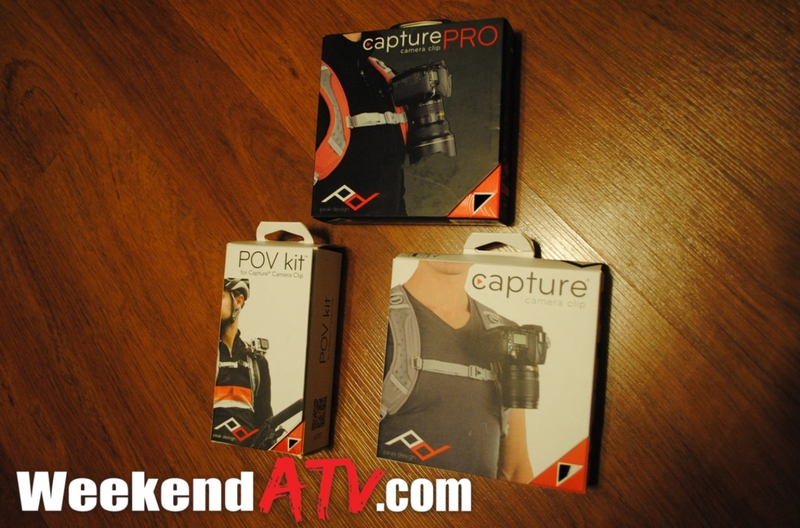 The POV kit is used in conjunction with the Capture or Capture Pro for use on a bag strap. It’s a great way to get a POV photo or video without the bulk of helmet mounts or extra harnesses. The POV mount is $29.95. Peak Design Capture Camera Clips and Capture Pro Camera Clip carry an MSRP of $59.95 and $79.95 respectively. They are also available in various bundles with other excellent Peak Design accessories like the Cuff or Clutch camera straps. 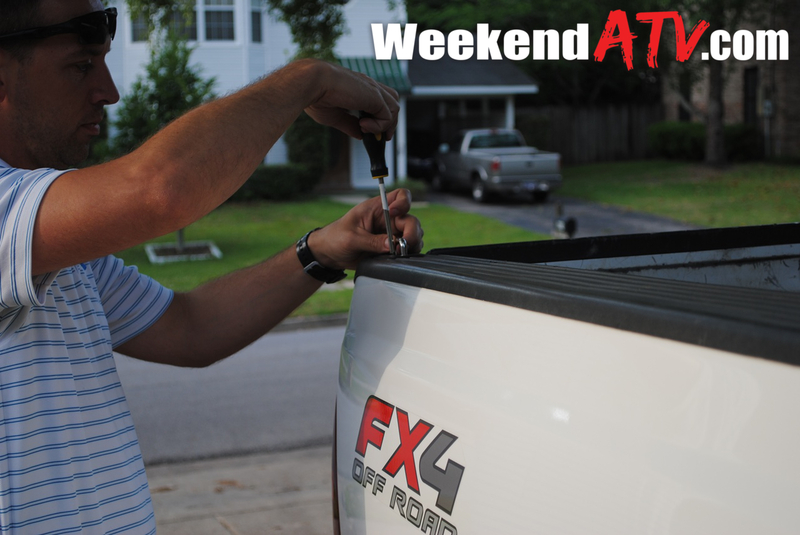 To make the deal even sweeter, use promo code weekendatv for 10% off your order! To see more details on the Peak Design Capture Camera Clips and other professional camera gear check out http://www.peakdesign.com. If you done any lengthy amount of riding you’ve probably experienced thumb soreness or fatigue from having to apply constant pressure to the throttle. Whether you are a new rider or its just the first few rides of the season, anyone can experience the pain. 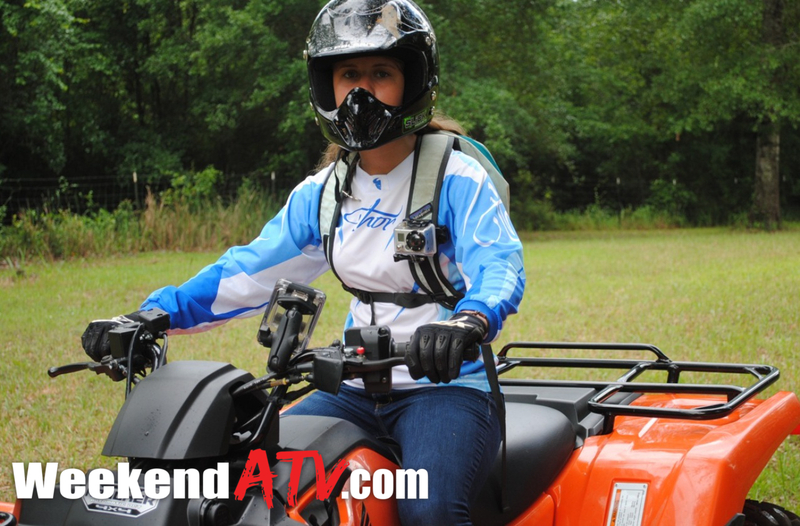 I picked up a Polaris Sportsman 90 for my youngest daughter recently and within a couple of miles on her first ride she was learning of that pain too. This past weekend we wanted to road trip to a new park, Clear Creek OHV. Knowing that it would be mostly trail riding we knew that thumb fatigue could quickly turn her ride from being enjoyable, so we picked up an All Rite Thumbuddy. 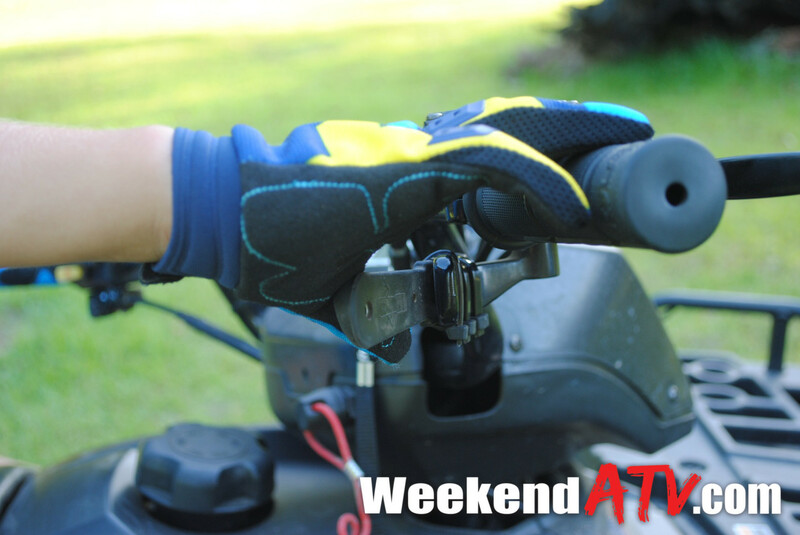 As a throttle extender it increases the surface area of the throttle and distributes the pressure from the throttle farther down the thumb and into the palm of your hand with a rubber coated, ergonomic design. Installation of the All Rite Thumbuddy is easy. It straps to your existing thumb throttle using 3 wire-ties which fit into channeled grooves in the Thumbuddy. 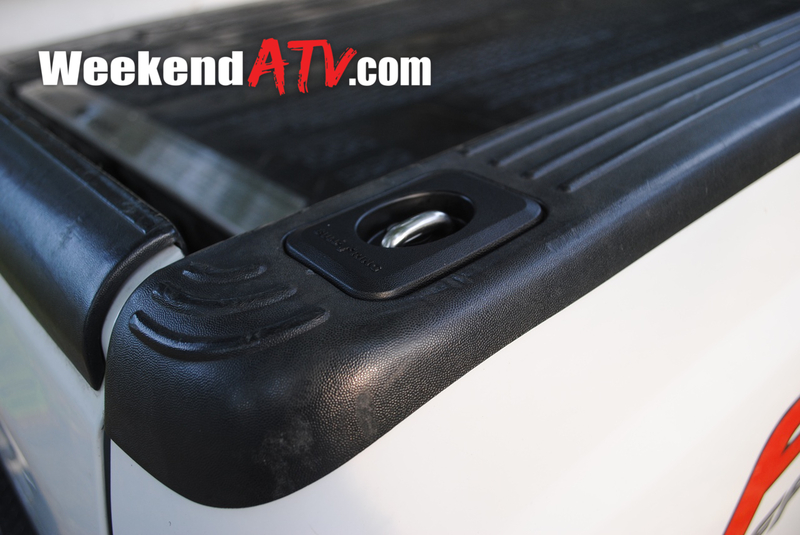 The design is universal so it will fit any ATV model. Once mounted it can be bent to a preferred form thanks to its steel core. It takes just a couple of minutes to get it set and ready to ride. We put in over 10 miles that day and with zero complaints of thumb pain. She (and all of us) had a great ride thanks in part to the Thumbuddy. 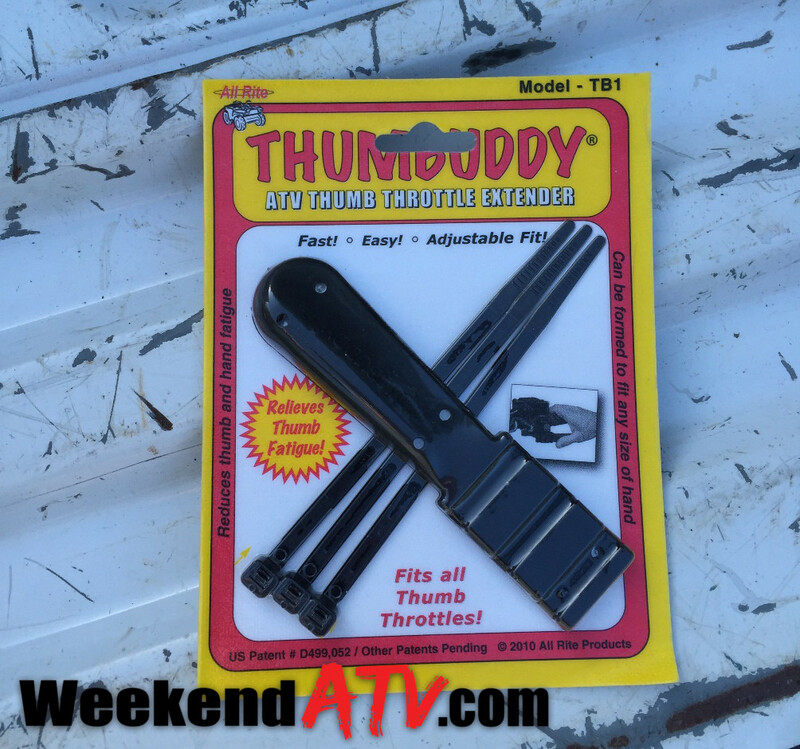 We picked up our All Rite Thumbuddy at Hall’s Motorsports for $19.99. It is available at many local motorsports stores and online. It makes a great add-on for young or new riders or anyone to increase the comfort of longer rides. 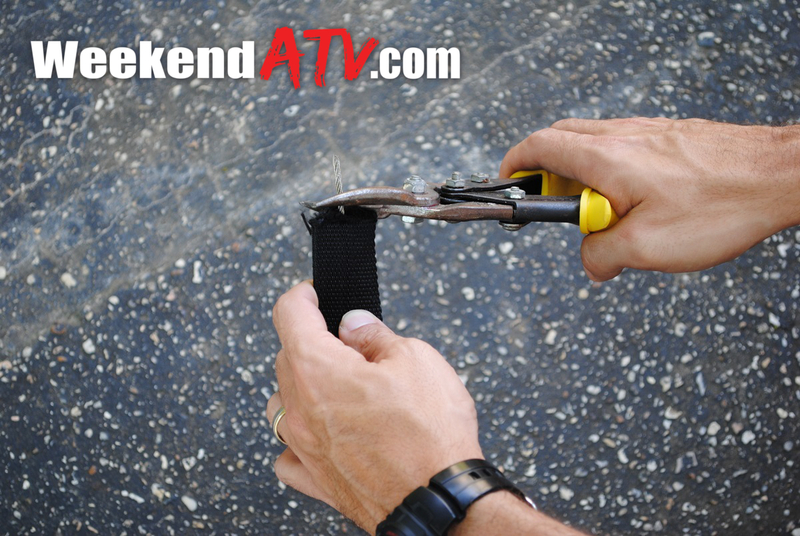 See more accessories from All Rite Products at http://www.allriteproducts.com/ including the All Rite Thumbuddy Pro which uses a stainless steel clamp instead of wire-ties. One of the major trends in the accessory market is LED safety whips. Many parks, especially sand dunes, require safety flags elevated high on whips to make riders more visible coming over a dune or hill. 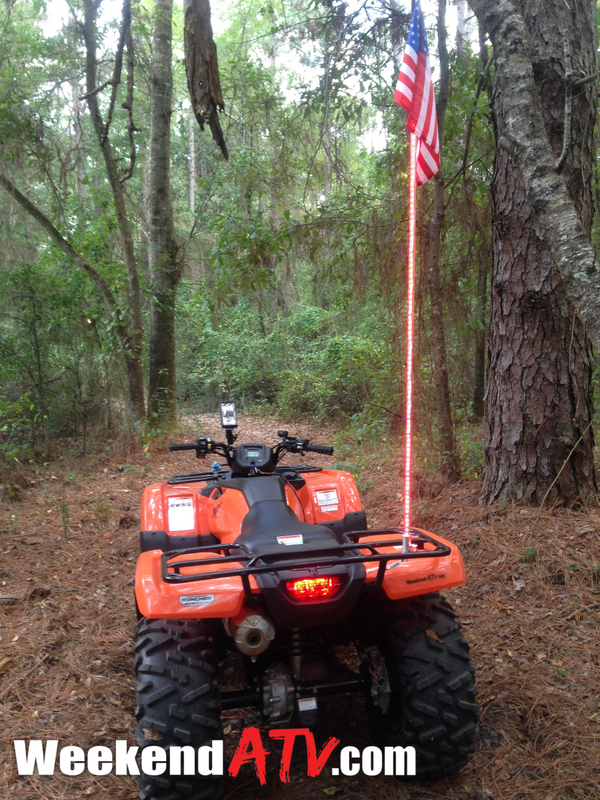 Changes in technology have allowed LED whips to become more visible than flags as the lighted whips are akin to light sabers hanging off the rear rack. Riding areas open after dark look like a sci-fi movie as neon colors dash through the dunes and trails. So we contacted Gorilla Whips to try out the Gorilla Whips LED Xtreme Whip. 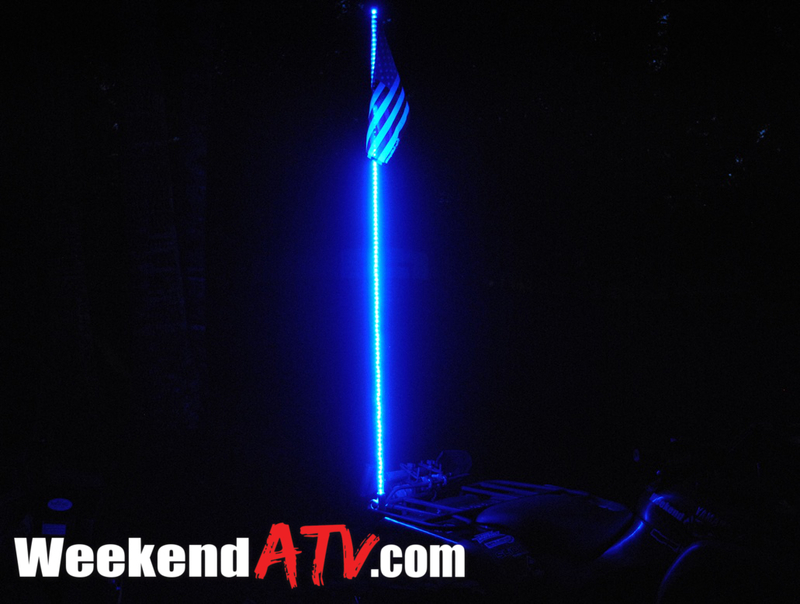 While there are several companies producing LED safety whips, Gorilla Whips are unique. Instead of purchasing a dedicated color, the Gorilla Whips LED Xtreme Whip has 20 different colors built-in. An inline remote control allows you to cycle through the 20 colors to choose your favorite. Your final selection is remembered, even after you power off the whip, for the next time you turn it on. The inline remote also allows you to rotate through 19 different patterns. Instead of the whip just glowing a solid color it can flash, fade between colors and create a random light show. A final button acts as the on/off button and can change the speed of the selected pattern. 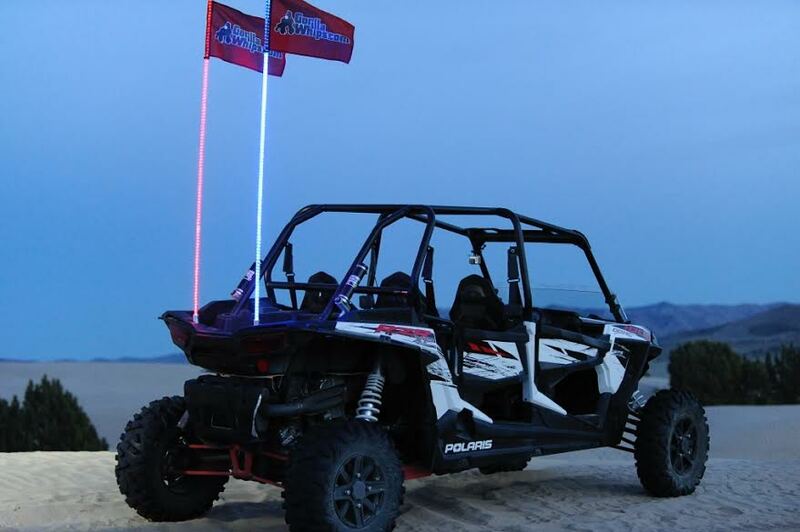 If you purchase a Gorilla Whips LED Xtreme Whip you will receive the whip, your selected flag, a wiring harness with a quick-release, quick connect wire splices, the billet aluminum whip mount and its mounting hardware. Installation is simple enough that instructions are not included but they do have an installation video on their YouTube Channel at http://youtu.be/cSTf2WX3X8M. 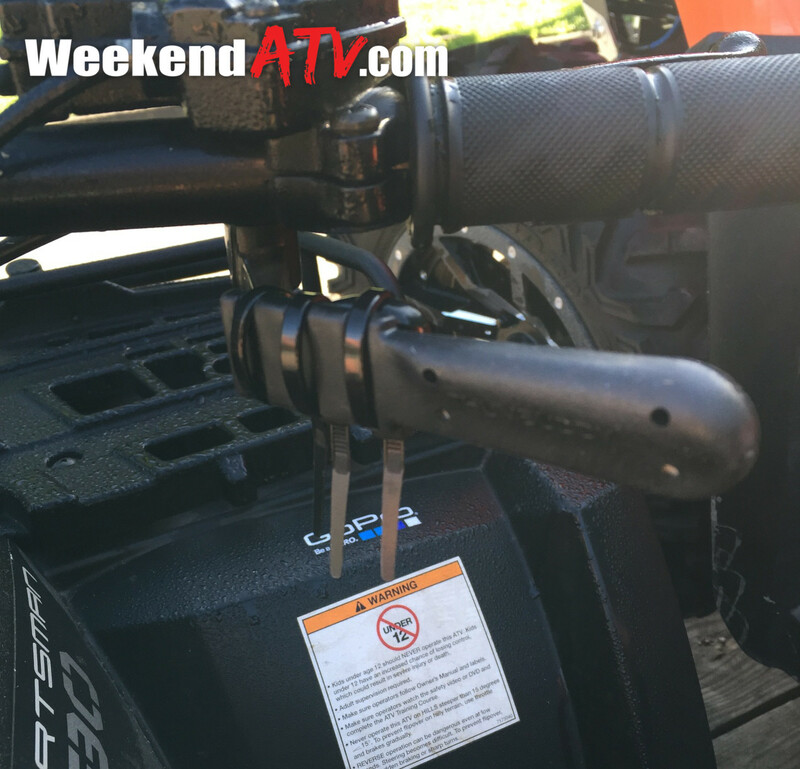 The billet aluminum whip mount is bolted to the mounting hole that your ATV likely already has on the rear rack or grab bar. This whip is inserted snuggly into the mount and secured with a quick release pin. The wiring harness is then assembled and connected to the battery or other power source. That’s it. The wiring harness on the battery side is the same as most trickle chargers meaning quicker installation if you have a trickle charger already. The Gorilla Whips LED Xtreme Whip is available in 3′, 4′ and 6′ lengths. Our 6′ model contains over 215 super bright LEDs. While we’re not able to compare the Xtreme Whip’s brightness to its competitors, Gorilla Whips backs their claim in their stronger, brighter, better guarantee. And if you manage to break it you can receive a discounted or even free replacement with their crazy crash guarantee. We did experience an issue where a small segment of the LEDs in our whip would flicker or not work at all. Gorilla Whips replaced it at no cost. The Gorilla Whips LED Xtreme Whip carries a price tag of $119, $129 and $139 for the 3′, 4′ and 6′ lengths respectively. That puts them in the higher price range compared to others, but again, you aren’t locked into a single color or pattern making them an incredible value. Their newest model even has a wireless remote control. 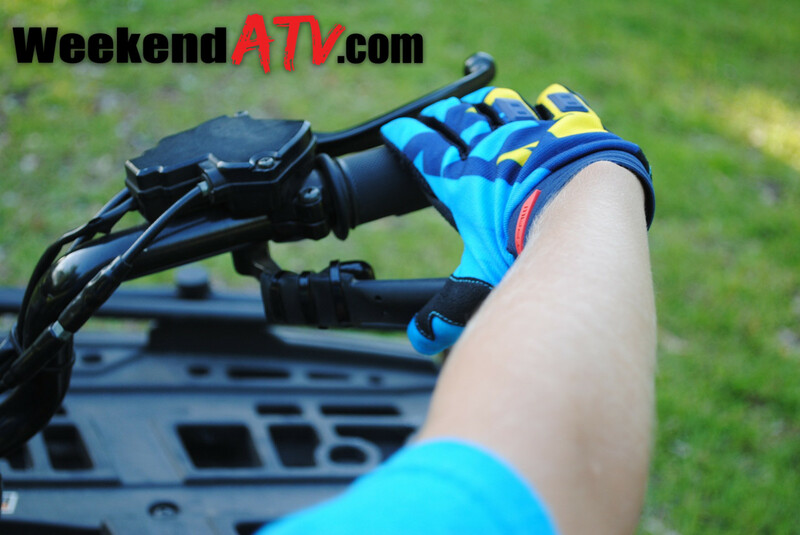 Gorilla Whips also offers standard ATV whips and replacement parts. To order your own check out http://www.gorillawhips.com. 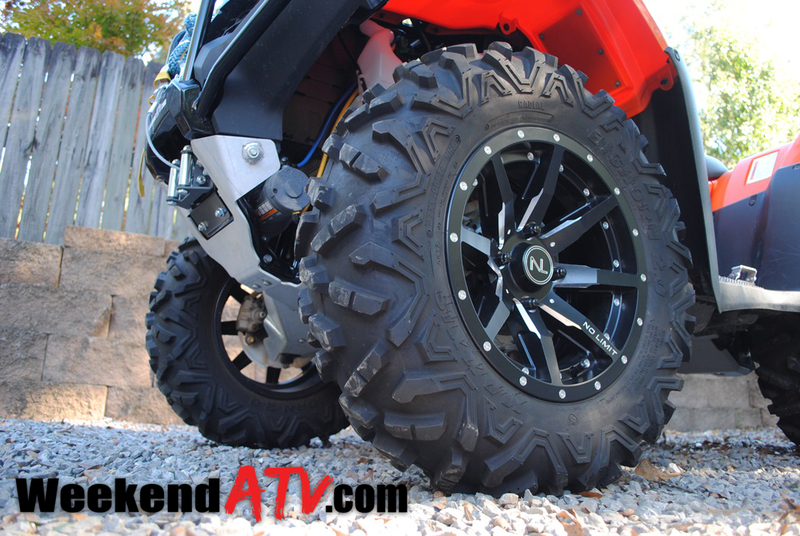 Custom wheels are, without a doubt, the number one upgrade in the ATV/UTV industry. No change has more of an impact on the look of a vehicle (on or off-road) than new wheels. And with dozens of manufacturers and styles its easy to create a unique look. But if you REALLY want to set yourself apart, there is only one choice: No Limit Wheels. No Limit Wheels are completely customizable and made to order to create more combinations than your local sub sandwich shop. With their online wheel builder you can create your own unique wheel. No Limit Wheels offers 3 wheel models in 12″ and 14″ sizes. Each is available in 6″ or 8″ widths and with multiple spacing offsets to accomdate straight rear axles or IRS configurations. Next choose from 18 different colors. Then choose from 3 styles available for each model. Finally select one of three rim edges. 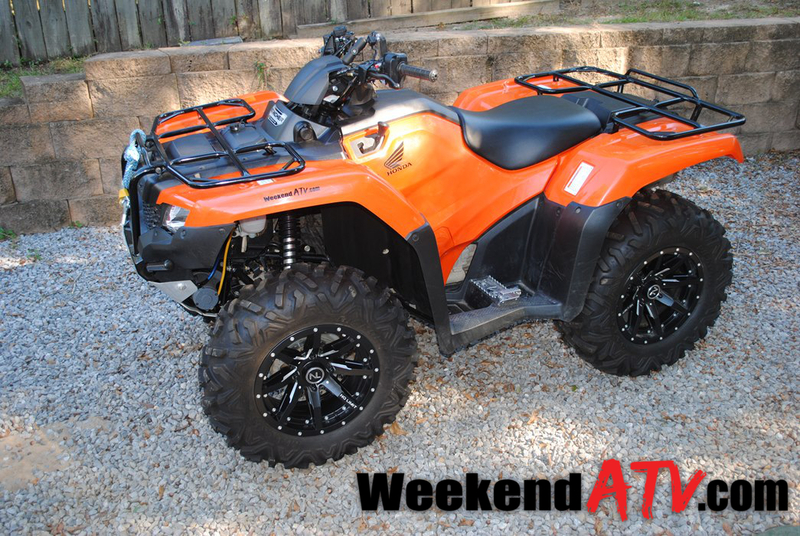 Want Polaris Orange Madness wheels on your Steel Blue Yamaha Grizzly 550? No problem. Honda Red wheels on your yellow Outlander? Okay. Hot pink wheels on your Kawasaki Brute Force? We won’t judge. Still no colors that work for you? 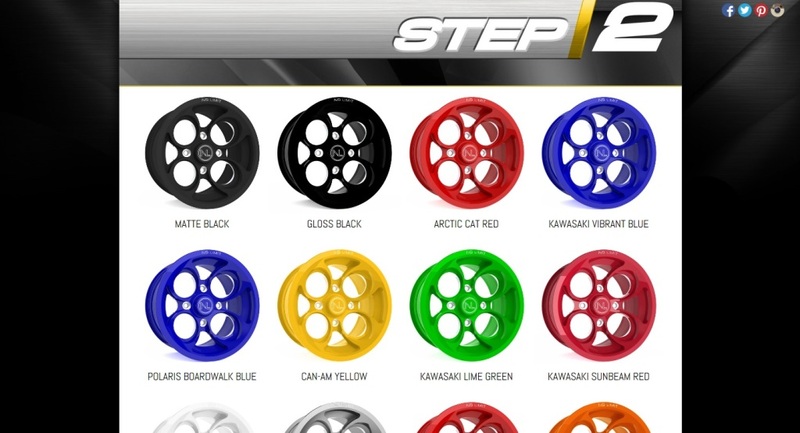 Call No Limit Wheels and they can help you with custom color options. That’s almost 2,000 unique wheels without even getting into custom colors! No other wheel manufacturer offers anywhere near that level of customization and personality in your ride. The wheels are etched out of aluminum and feature a double reinforced rim edge for strength. They have a 1000 lb load rating each; 30% more than most available wheels. Each wheel weighs in at about 12-14 lbs. For our 2014 Honda Rancher, we placed an order for a set of 14″ No Limit Octane wheels in Positive style and with Bullet rim edge. We had it finished in matte black, a perfect match for our orange Honda. We wrapped them with Maxxis Bighorn 2.0 rubber to create a trail combination that looks as good as it performs. We were pretty stoked with the outcome. Despite the totally custom options, No Limit offers a 30-day, 100% money back guarantee if you are not satified with your purchase for any reason. Further backing your good decision, No Limit Wheels are accompanied by a lifetime limited warranty. No Limit Wheels is based in the United States and every wheels is made right here. The base wheel starts at $88 with each option adding a couple of dollars. 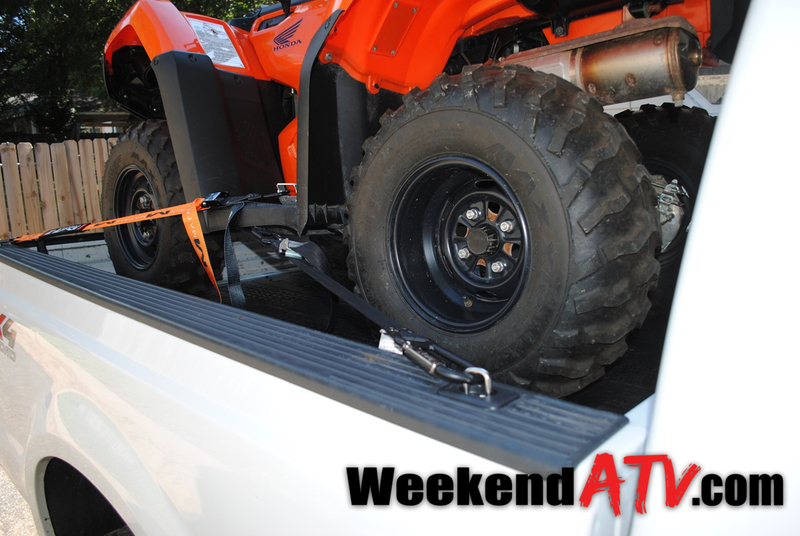 To preview No Limit Wheels on your ATV and get your order rolling surf over to http://www.nolimitoffroad.com/. 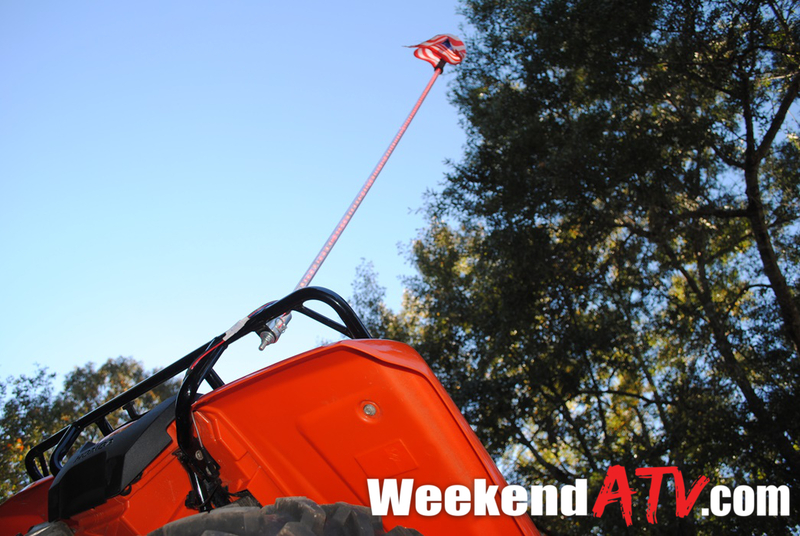 Like many of you, I frequent several large ATV communities and groups on Facebook and other sites, looking at pictures of your rides, great deals and various information. 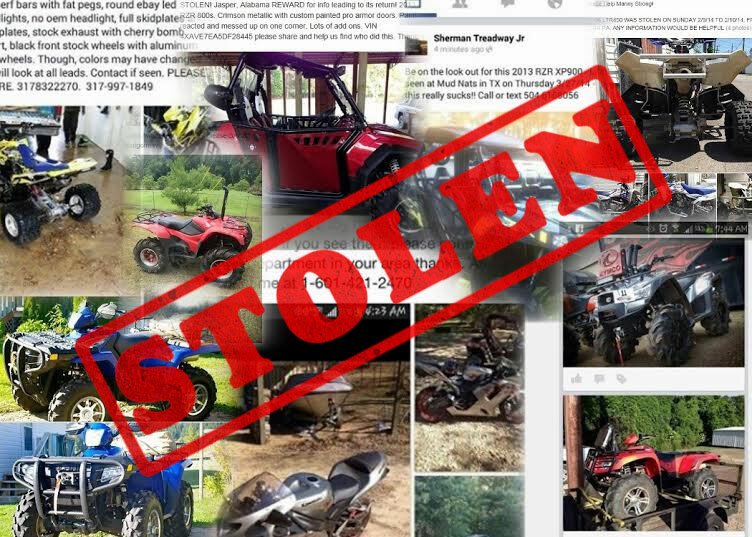 Unfortunately it’s rare to not see a post from someone about a missing ATV or UTV, stolen right out of their backyard. Powersports thefts are prevalent everywhere. 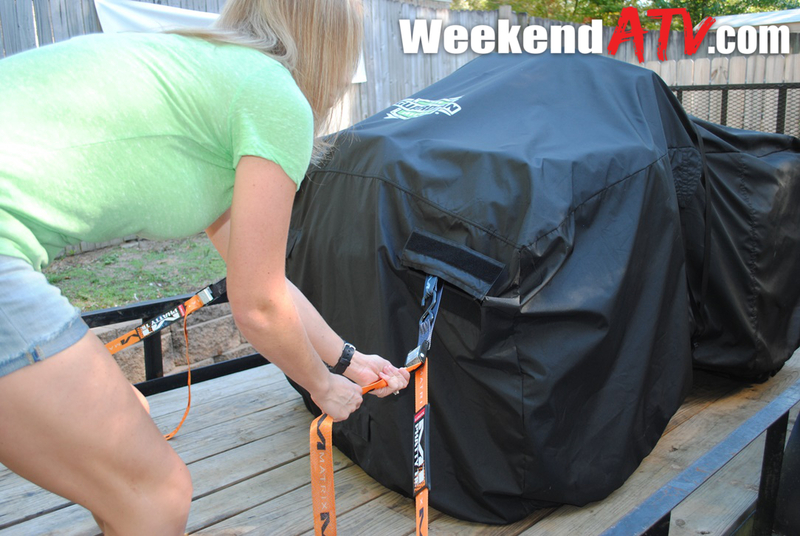 Lockstraps creator Jeff Cranny had a similar experience in 2009 when his motorcycle and gear were taken right out of the back of his truck. It was following that experience that the idea of Lockstraps was born. At a glance, Lockstraps are just tie-down straps with a combination lock carabiner replacing the normal hook. If that’s all you take away from them then you have sold yourself very short. They are much more than that. Let’s start with the carabiners. Each end of the Lockstrap features a carabiner, allowing you to securely anchor each end of the strap and anything its be routed through. The carabiners are made of #64 hardened/heat-treated steel. The loops are big, 6 inches by 3.5 inches. A 3 digit combination lock means you don’t have to keep up with another set of keys, yet makes the lock quickly accessible when you need it. You can set your own combination and change it anytime. The strap is 1.5 inch wide, heavy-duty nylon; and thicker than any other strap I’ve used. Galvanized steel rivets used have a working load of 500lbs and there is an extensions on one end of the cable to keep the carabiner from direct contact with your toys to prevent scratches to your paint of plastics. Now when I first showed Lockstraps to a friend of mine his reaction was “That’s cute” as he pulled out a pocket knife, threatening to make quick work of the nylon. That’s when I pointed out the steel cable embedded in the middle of the strap, from one end to the other! In our tests, we found that it took a set of steel snips to be able to cut through the braided steel cable. 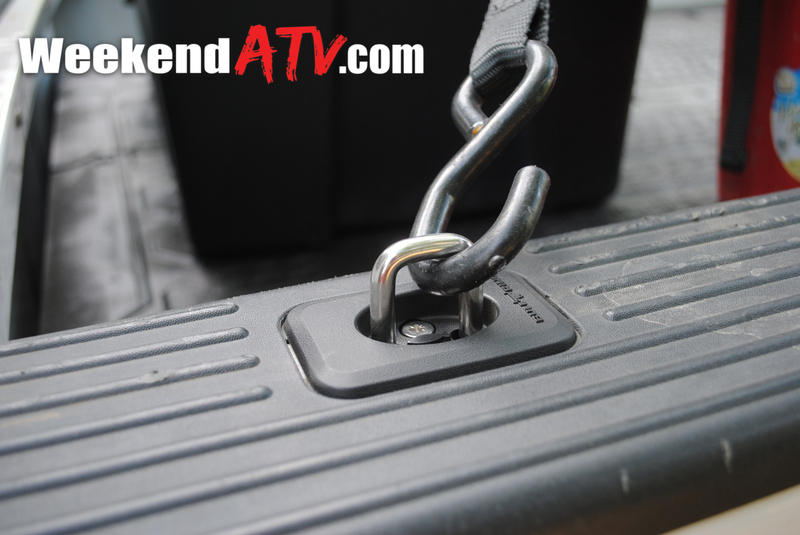 Despite the cable Lockstraps are very flexible and easy to manage. The Lockstrap tie-down is 8.5 feet long. The also have a 24ft version and a 2ft version each with only one carabiner. 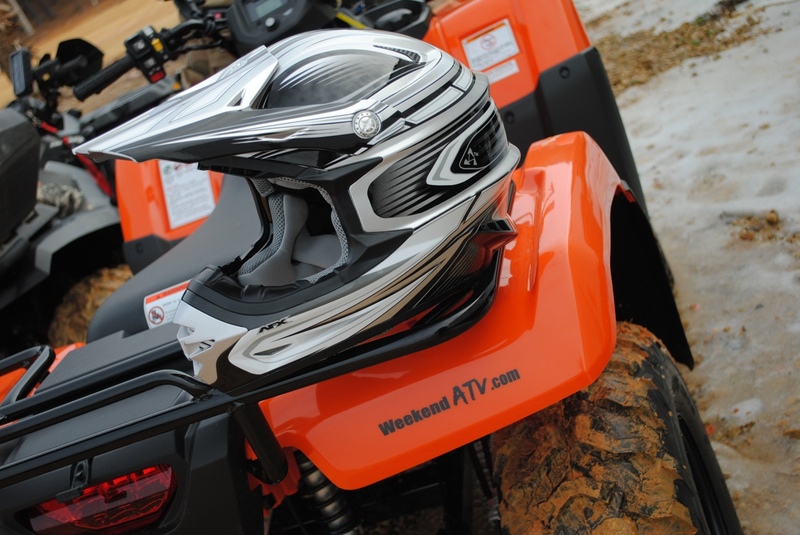 The 2ft version is perfect for locking your helmet to your ATV. You can also purchase the carabiner alone for endless other security uses, like securing your existing straps. Sure, with the right tools, someone could still make off with your prized possession, but ultimately there are few things you can do about a determined thief. Lockstraps will thwart the opportunistic theft and delay a fast getaway for the more prepared thief. Very few items will have a better return-on-investment. We use Lockstraps religiously now as one of our tie downs. It offers peace of mind for meal and hotel stops as well as just being at home. The Lockstrap tie-down is $39.95. The 2ft model can save your $200 helmet for only $24.95.The 24ft Universal strap runs $44.95 and a stand alone carabiner is $15.95. To see more applications for Lockstraps and to order your own check out http://www.lockstraps.com. 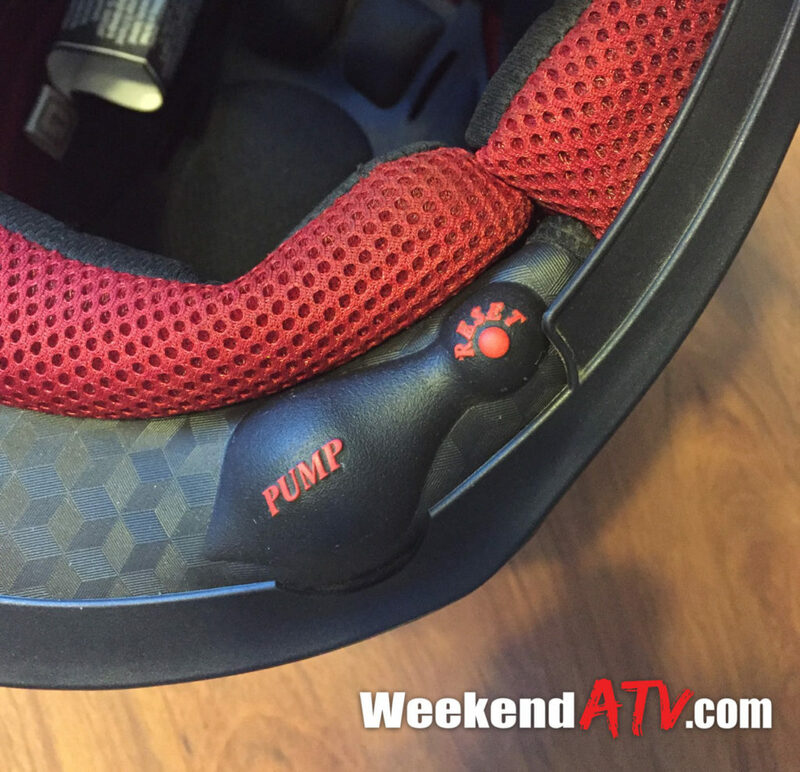 Love them or leave them helmets are very much a part of the powersports industry and there are a lot of names in the helmet market. Among those common names is AFX. AFX North America, Inc. was established in the mid-1990s. The founders saw big helmet companies were regularly increasing the price of helmets without offering new innovations to justify that cost. So, in true American fashion, they began creating their own helmets designed to give users feature-rich helmets at reasonable costs. The new AFX FX-21 helmet is proof that after almost 20 years in business they still stand behind that business model. The AFX FX-21 helmet has an aggressive design. Traditionally helmets have curved in around the bottom, but a recent trend has been that helmets flare out at the lower back of the helmet. While style is all in the eye of the beholder it adds a nice change. It does not interfere with the mobility of the helmet at all. Another innovation in this model is the goggle strap guide across the back, also a trend across the industry. This formation across the back of the helmet keeps your goggle strap from sliding up or down across the helmet and keeps it properly lined up during riding. The AFX FX-21 helmet is cleaned like most helmets by simply wiping it down. 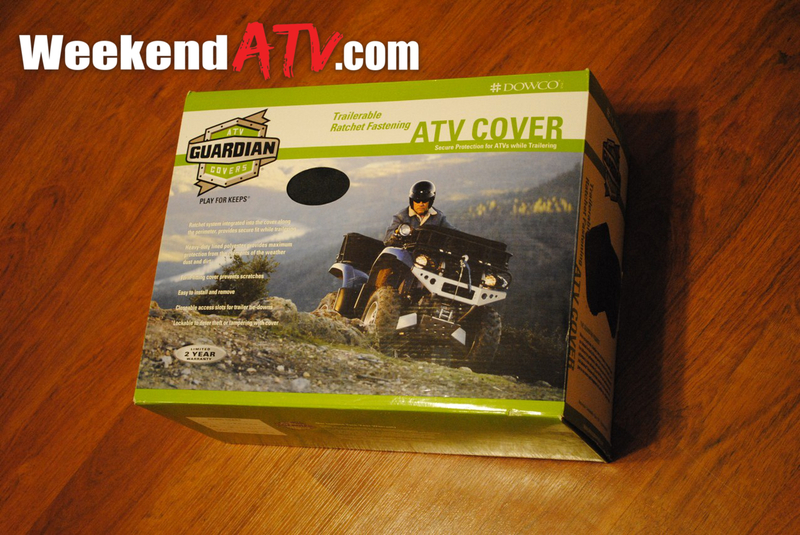 The liner and cheek pads are easily removable for cleaning. They do have to be hand washed; machine washing is not recommended. Being able to machine wash the liner and pads is the biggest improvement we would like to have seen. They do hand wash pretty easily and dry out in a couple of days. Everything snaps back in place with no issues. Ventilation is provided at the mouth (which is filtered by a thick, foam pad), vents on each side of the jaw, two just aft of the top of the helmet and a pair at the back of the head. There are also vents at the top of the eye opening which direct air into channels that run over your head and down the back of the neck. None of the vents can be closed off. It also includes an adjustable visor that can be removed. On the safety side, the AFX FX-21 Helmet uses their trademarked CONE-HEAD Technology. According to AFX, the outer shell and the impact absorbing, foam liner are fused together. With this design the force of an impact is pushed out to the sides rather than taken full by the helmet and skull. It also helps with the helmets weight; only 2.95 lbs for a size large. 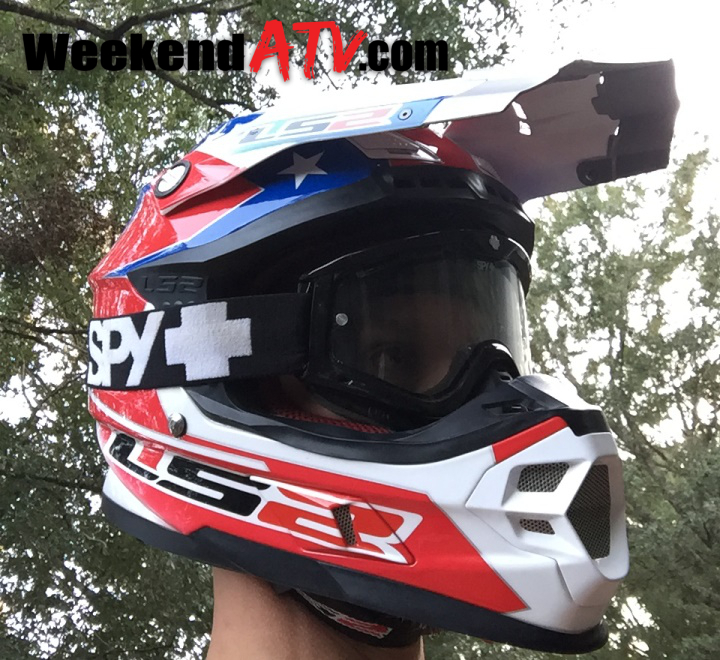 The AFX FX-21 Helmet is DOT certified and meets the standards for AMA and several others. The fit is good and snug and plenty comfortable for a day of riding. The AFX FX-21 Helmet is available in 3 solid colors and 8 colors of the pattern shown in our sample. Solid colors carry an MSRP of $129.95 with the patterns at $139.95. 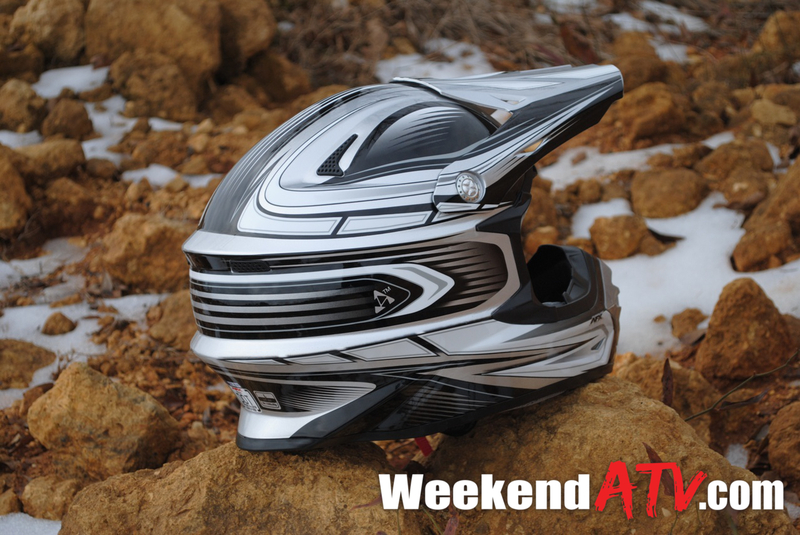 AFX helmets are available through a select few retailers. To find one near you check out http://www.afxhelmets.com. 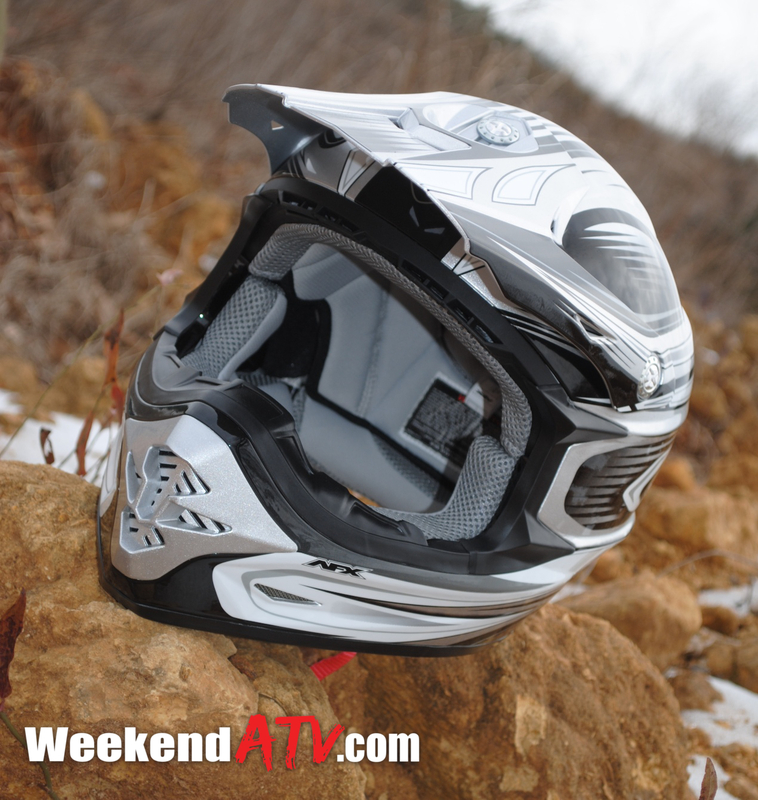 The AFX FX-21 should be a consideration when looking for a good budget priced helmet. There have been brief times in my life where I thought I could get by without a truck. Times when I thought that an SUV and a trailer would be sufficient. I have come back full circle and its a mistake I won’t make again. The usefulness and convenience of a truck bed are unmatched. 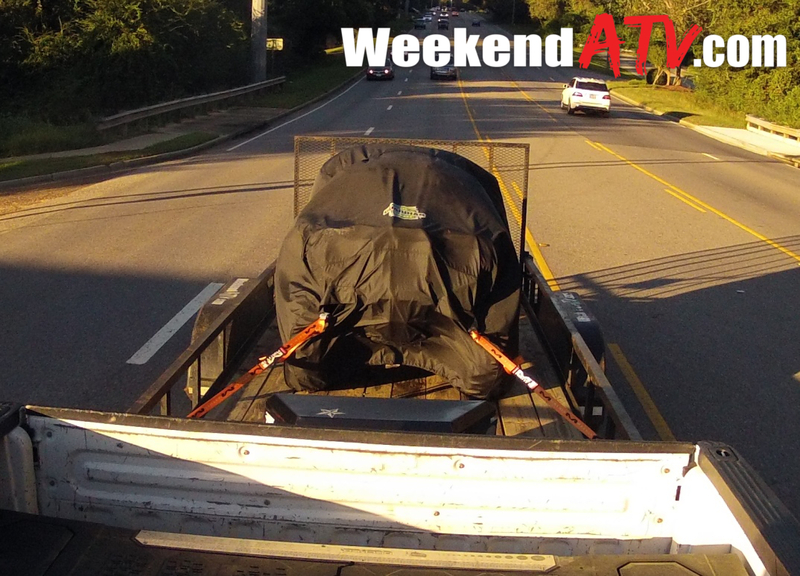 But that’s not to say that there aren’t improvements that can be made to your toy hauler. Something I had noticed was a need for more tie down locations. 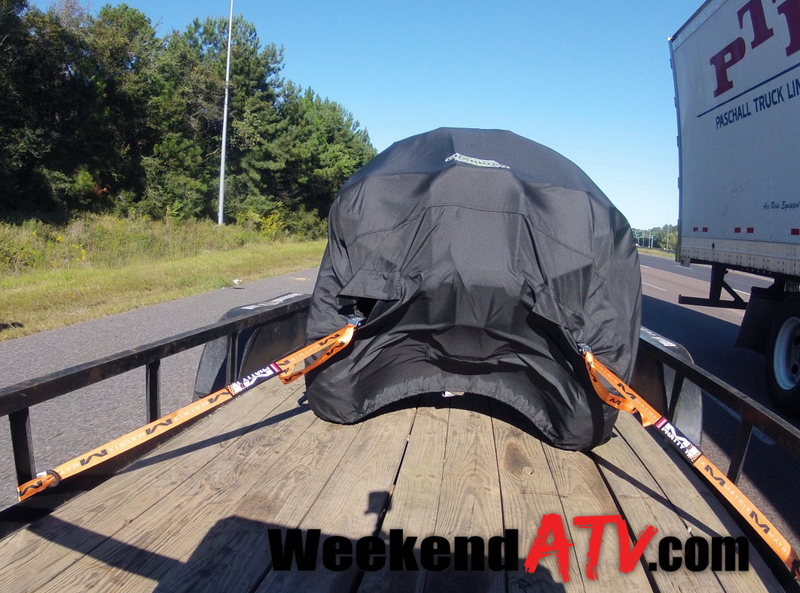 Most trucks have a set of down locations in the corners of the bed as well as the stake pockets on top of the bed. I wanted a cleaner and more secure location than the stake pockets as they come so I picked up a couple of sets of Bull Ring Retractable Tie Downs. Bull Ring is not new to the market. They have been producing tie downs for over 30 years and have sold over 1 million pairs of tie downs. Bull Ring Retractable Tie Downs mount in the existing stake pockets and secure by clamping against the top and bottom of the bed rail. No drilling or special tools are required, only a Phillips head screwdriver. The installation takes only a couple of minutes each. To install, start by removing both screws from the top. Insert the tie down into the bed rail pocket and center it. Pull up on the ring until it clicks into the up position. Now put both screws back in and tighten them down snug. The rings snap into place in the upward position and snap back down flush to a smooth, clean look. The base plate is available in the black plastic finish shown in our samples or in a smooth stainless steel finish. 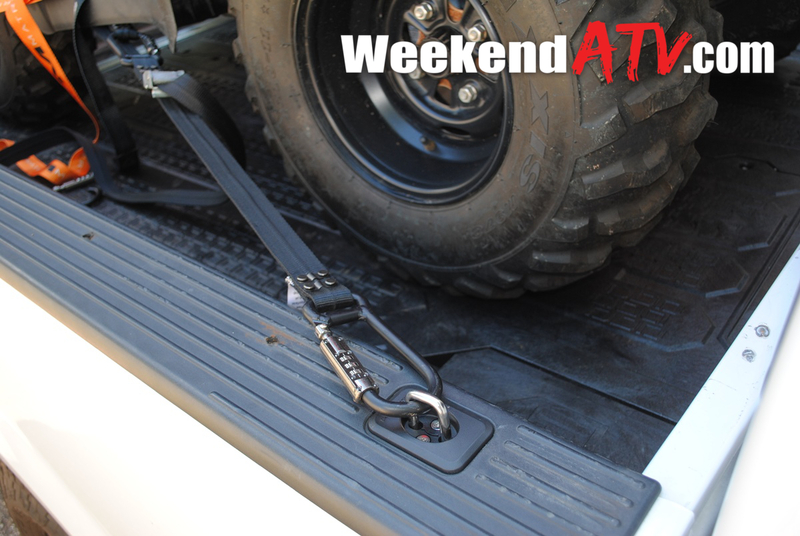 Bull Ring Retractable Tie Downs are made of stainless steel to last as long as your truck does. They are rated at 1,000 lbs. each and are sized to accommodate two ‘S’ hooks. They are also covered by a lifetime warranty. 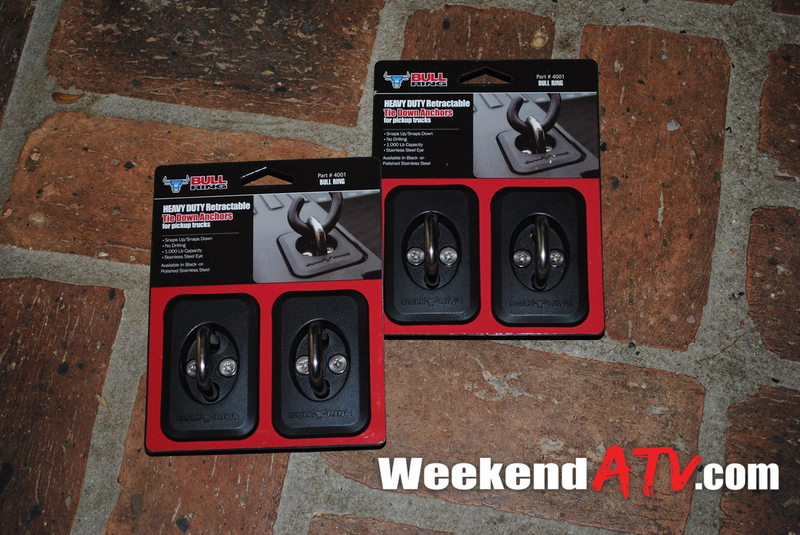 A pair to Bull Ring Retractable Tie Downs will cost you a very reasonable $29.95 in the black base finish or $32.95 in the stainless steel base finish. Bull Ring also offers many other tie down anchor points for Most Ford, Chevy/GMC, Dodge and Toyota trucks. To order you own pair (including free shipping!) check out http://www.bullringusa.com.